“Deadly anti-Christian attacks have become commonplace in the Muslim world. Catholics need to know about them, and they also need to know the “why” of these attacks. There will be no end of the bloodshed unless we understand why it’s happening. “On this point, the USCCB has been remiss. 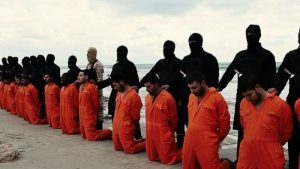 Numerous USCCB statements over the last 17 years have, in effect, absolved Islam of the crimes committed in the name of Islam. Instead of naming the religious ideology that motivates the terrorists, Church officials have been content to echo the mantra that terrorism has nothing to do with Islam. “Meanwhile, in the face of the Islam-inspired genocide of Christians, the USCCB has joined up with the problematic campaign against “Islamophobia.” This strikes me as a grotesque inversion of priorities. At a time when Christians need to be alerted to the dangers posed by the spread of Islam, why are bishops throwing themselves into the Muslim Brotherhood-manufactured battle against “Islamophobia”? I put “Islamophobia” in quotes because a phobia is an irrational fear. But many people—including Christians living in Egypt—have good reason to be afraid. It does a disservice to them to say that their fears are baseless. Or to say that they have nothing to fear from authentic Islam.